Old map by DRAKENSTEIN -Cafri - Conda , Pars XII, Tab. 70. Title: Cafri - Conda , Pars XII, Tab. 70. Size: 13.4 x 16.5 inches. Condition: In fine condition with minor scattered foxing. A fine, scarce, large, copperplate engraving of South Asia flora. 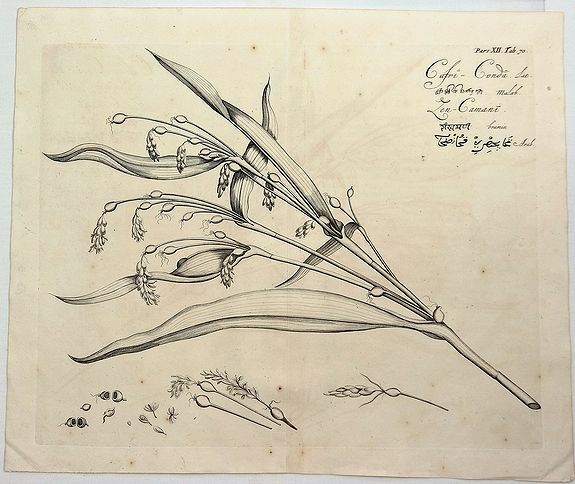 From the very important book on Indian botanicals by Drakenstein. The name of the flower is repeated in Latin, Malabarese, Sanskrit and Arabic. It is from "Hortus Malabaricus" (meaning "Garden of Malabar") a comprehensive treatise that deals with the properties of the flora of the Western Ghats region principally covering the areas now in the Indian states of Kerala, Karnataka and the union territory of Goa. It was published in Amsterdam by Johannis van Someren, and Joannis van Dyck. Hendrik Adriaan van Rheede tot Draackenstein (1636-1691) was commander of Malabar and was responsible for compiling the "Hortus Malabaricus", a major publication of the flora and medicinal use of plants, which took 30 years to complete. He employed 30 people on the project. It is possibly the most important work on Asian flora. Reference: de Belder 302, Nissen 1625.